Renowned guitarist Eric Tingstad has traveled many roads during his four decades of making music. He has popularized New Age and contemporary music and crossed over to Country and Americana. Now, like Benjamin Franklin, Mr. Tingstad has discovered electricity. Unlike his previous works that are location oriented and acoustic, Electric Spirit is a standalone project with some great covers as well as engaging original material, all with a finely-crafted rock sound that never overpowers the performances. Also unlike his other works, this one features him on electric guitar. And finally, going over the edge, Tingstad has included a vocal. The album starts with the tune Electric City, a ditty with an edgy Hammond organ background and some bluesy guitar that get the juices flowing. It really reminds me of every visit I have made to New Orleans. When you get off the plane, you can feel the electricity in the air. This is a strutting tempo that keeps you on the go. Everything on the album is straight out with few overlays and no sampling. It preserves the music as more dynamic and stylish. It’s no surprise that the next cut is called French Quarter. It’s a great segue into the nighttime hours where the bourbon and blues continue way past the wee small hours. Two of the more moderate tunes on the recording are Shenandoah and Amazing Grace. Tingstad takes these chestnuts and adds a bit of jazz and panache, breathing new life into them. Shenandoah is reminiscent of some of past albums, but the electrics gives it a new flavor, a revisionist point of view of the 1860's version. The standard Amazing Grace is rendered slightly up tempo, but its familiarity makes it comforting still. Chloe Dolandis (Bring Back the Fever) out of Nashville adds her sweet voice to the tune There's More, a most unusual addition from Tingstad. The tender ballad is a song of hopefulness and a heart that is ready to learn. Dolandis' vocal is poetically charming while Eric's tune flows freely and is buoyantly fresh. Yes I know there's more." There is a driving force inside the notes of South to Carolina. The music at first reminded me of driving down a dusty dirt road, but then I found myself on the Carolina coast looking out at the ocean and wondering what people in Portugal are doing today. That's the kind of song it is, tomorrow is just a daydream away. The Train of Thought is a rollicking tune full of energy and vigor. If you have a heartbeat, you'll be tapping your toe to this ditty that has all the freedom of the open prairie, the majesty of the Rockies and the down home exhilaration of an Appalachian festival. Under Eric's treatment, Harold Arlen's classic Over the Rainbow actually sounds romantic. The idea of endless yearning has been replaced with a sense of nostalgia and a comforting peacefulness in this classic remake. It is like seeing a familiar painting done up in fresh colors. You know what it ought to be, but the results are more than pleasing. 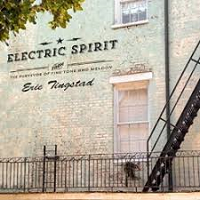 There's never any doubt on Electric Spirit that Eric Tingstad is a master of his instrument, whether it be the electric guitar, a resonator, or pedal steel guitar, all included on the album. Joining him are organists Eric Robert and Brooke Lizotte. On bass, James Clark, Chris Leighton on percussion, and additional vocalists Cindy Walker and Marie Lewey and drummer Ben Smith. And let us not forget the sweet voice of Chloe Dolandis. On Electric Spirit, Eric Tingstad offers up a remarkable collection of easy going songs in a Clapton-esque framework that is incredible pleasing for any audience that appreciates music with technical proficiency governed by a great deal of heart.